To stimulate public interest in Woolton. To promote high standards of planning and architecture in Woolton. To secure the preservation, conservation, development and improvement of features of general public amenity or historic or public interest in Woolton. • Maintaining an awareness of planning applications and City Council proposals affecting the Woolton area. • Making formal comments on significant applications and proposals to Local Authority departments and Councillors. • Issuing a regular Newsletter to all Members. • Holding periodic talks, open to non-members, with speakers on topics of local and general interest. • Encouraging research and documentation of local history. In support of our work the Society also publishes books. 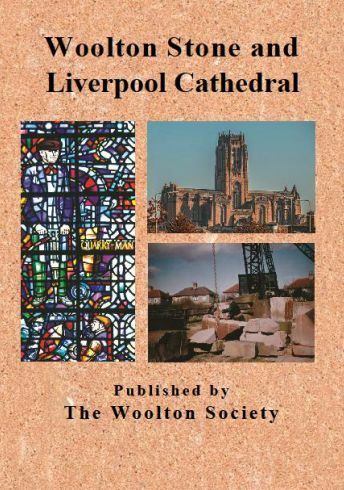 The latest of these, "Woolton Stone and Liverpool Cathedral" is now available, and may be prurchased at any of the talks, or or the Society stall on the farmers market, as well as from Brown's Newsagent in the village, or the Cathedral bookshop.